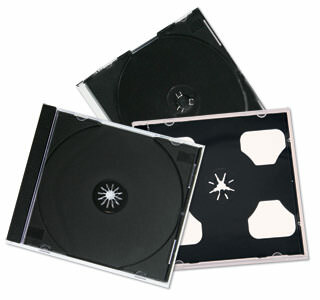 The CD jewel case is a standard format of packaging that’s been continually in use since the introduction of the compact disc (CD) by Phillips in 1982. This packaging option supplements a disc while shielding its sensitive data from harmful elements such as dirt, scratching, and exposure. The first album released in a jewel case was Billy Joel’s 52nd Street. Billions have since been manufactured. The jewel case allegedly derives its name from its Phillips designer, Peter Doodson, who named it the jewel case because he claimed it was the perfect case design that also picked up light from certain angles. Initial mock ups were made of glass, wood, and other materials and were found to be ineffective for the case’s desired function. The case consists of three pieces of plastic constructed into a book-like style that measures 142mm x 125mm x 10mm and contains a tray to hold the disc. This construction provides storage for not only the compact disc but a back card and tabs for inserts. The back card typically provides a table of contents for the disc while the front facing inserts display artwork, logo, titles, or other additional information in the preceding insert pages. The case itself weights between 68-100 grams. A black or transparent disc tray is molded to conform to the disc’s shape and dimensions while the center hub contains grooves to grasp the disc and anchor it to the tray. The disc tray also rests in the middle of the case to prevent damage to the CD’s surface from a closer proximity. First generation versions had heavier durable construction than later models. Some of the detail flaws included flimsy hub teeth and fragile hinges. Replacements of higher durability are now available on the market for purchase. The jewel case has spawned a variety of other media cases. These include a derivative product that is much slimmer and more colorful: the Slimline. There are also multi-cases that can hold up to 6 discs. Or the Digipak, an eco-friendly gatefold alternative with cardboard panels.